Epithelium: the outermost layer that provides protection. This layer is home to thousands of nerve endings, which is why it is so painful when you scratch or injure the front surface of your eye. 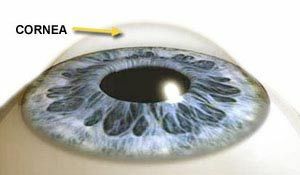 The cornea is the only human tissue in the body that does not contain blood vessels. Instead of receiving nutrients from blood vessels like the rest of the tissues in our body, the cornea gets its nourishment from a fluid inside the eye called the aqueous humor and also from tears. Our tears are not only important for nourishment, but they also help to focus the light as it enters the eye so we can see clearly. What are the most important functions of the cornea? What diseases or conditions affect the cornea?